When I think of design, of course I think graphic design or interior design, but have you ever thought of another talent that people have....floral design? I never thought much of it until I received this beautiful arrangement from Lowe's Floral. 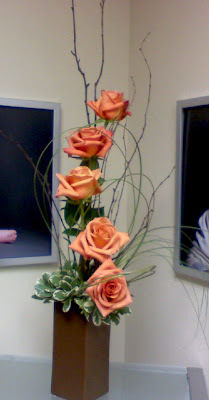 Sure, flowers are pretty and it is always nice to receive a bouquet, but this arrangement was stunning! So simple and elegant and classy. It made me appreciate the art of floral design. Beautiful! Again congrats to you on your award!